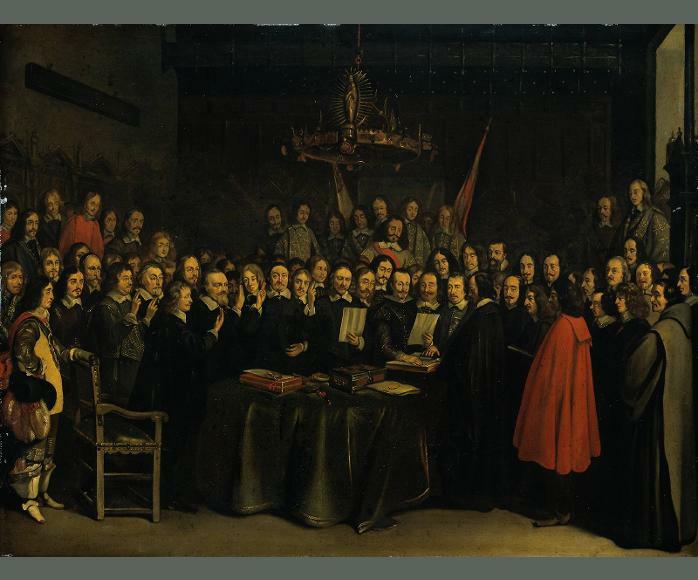 Last week we co-hosted the conference on early modern sovereignties in and around the Low Countries! This might seem as a very traditional approach for a research group on transregional history, but this was all about further deconstructing the Westphalian myth. Though amply mentioned in diplomatic treaties and politico-juridical treatises of the time, the concept ‘sovereignty’ is difficult to grasp from an empirical point of view: does one have to keep up with current definitions and then benchmark the past on this measuring stick, or does one have to point at the fluidity of the concept, and its manifold practices? Hence, this conference aimed to find a middle ground between studies in political theory and studies in political practice, and it surely sparked ample discussions. Werner Thomas acted as co-host on our part, and Bram De Ridder gave a presentation on the increasing citing of ‘sovereignty’ in treaties between the Habsburg Netherlands and the Dutch Republic, and on how this affected the discussions on the emerging border between the two territorial clusters. The conference volume will appear in the series Studies in the History of International Law, edited by Brill.